This cute little boy is 5 years old! Hayden has a dislocated hip and has been diagnosed with a need related to the bones in his legs and feet. We’re currently obtaining updated information about him, as his file is very outdated. 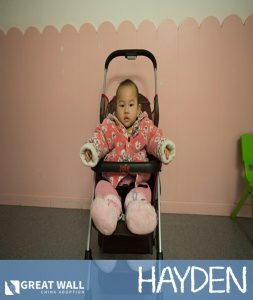 According to an update in 2014, Hayden was unable to walk with assistance, but he was receiving rehabilitation therapy every morning and afternoon! He was able to crawl around to where he needs to go and say a few words. Hayden has been described as a shy little boy, but he loves listening to music and giving hugs to his caretakers! Please reach out to us at GWCA to learn more about Hayden! This precious kiddo is 8 years old. Everett was born blind but does not have any additional diagnoses. 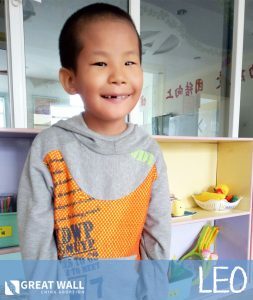 From 2010 to 2015 he lived in a foster environment but returned to the institution to receive a better educational experience. 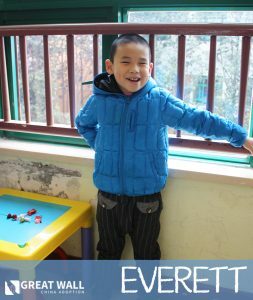 Everett is described by his caretakers as being smart, cute, active, and extremely well-liked by everyone he meets! Because of his eyesight, his fine motor skills have been slightly delayed. He is cognitively on target compared to his peers and even knows a lot of English! Everett is energetic and curious about everything. He loves remaining close to his caretakers so he can ask them questions and explore more. Everett loves to sing and listen to music and watch Dora the Explorer! He is described as being very helpful and thoughtful and is always willing to help other kiddos. Contact us at GWCA today if you are interested in learning more about Everett!